Special design for small scale yogurt production line, installwho plant equipment on a skid frame work. The pretreatment of the milk is the same, regardless of whether set or stirredyoghurt is to be produced. It includes standardisation of the fat and drymatter contents, heat treatment and homogenisation. It is assumed that the milkhas been standardised to the required fat content before entering the line andstandardisation of the dry matter content takes place in an evaporator in theprocess line. If the dry matter content is adjusted by addition of milk powder,the equipment used is similar to that described under “Recombined milk”. Anyadditives, such as stabilisers, vitamins, etc., can be metered into the milkbefore the heat treatment. When the yoghurt has been pretreated and cooled to inoculation temperature, theprocedure for further treatment depends on whether set, stirred, drink, frozenor concentrated yoghurt is to be produced. The quality of the yoghurt in termsof texture and flavour is essential. Shanghai Beyond Machinery Co., Ltd is a professionaltechnology developing enterprise which mainly engaged in healthy equipmentfields. 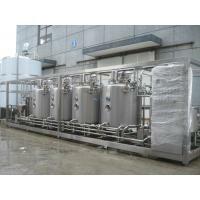 Combined with R& D, procedure design service, turnkey base project, equipment manufacturing, installation, commissioning and training, our company is specialized in turnkey projects services widely applicable to food industry ,such as : fruit and vegetable juice, dairy product and beverage, meat and bone, egg product etc, and others include pharmaceuticals and fine chemicals as well. Beyondacted as pioneer to introduce and absorb advanced international technology andprocedures, continuously innovate and positively promote deep communication andcooperation inside industry, which high effectively push industry develophealthily and orderly. Beyond’s company culture of Honesty, practicality, innovation,happiness gathered many excellent professional technical talents who is rich ofpractical experience. The predominant team with tactical management and advancedinnovation achieve perfect product quality for BEYOND. Shanghai Beyond Machinery Co., warmly welcome our new and oldcustomers come to visit our company and have business talks.